There are so many emotions and so many questions following a house fire that it’s hard to know what to do next - who do you call, where do you begin, and when is it safe to reenter your home? There is hope for recovery, for a new life, and a restored home and Rainbow International is here to help. With so much experience in fire remediation we know first hand how hard this time is. 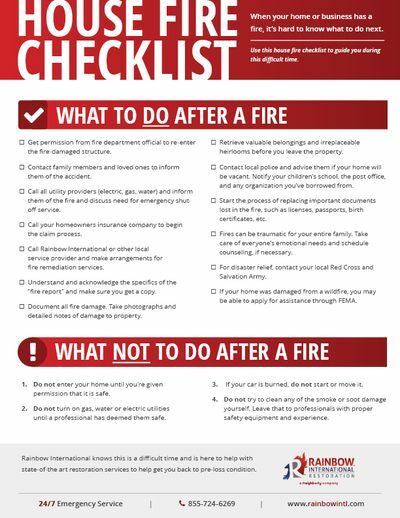 That’s why we’ve created this House Fire Checklist, to help you take the first steps toward recovery. 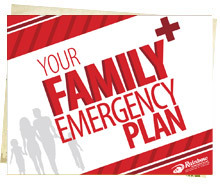 Download this checklist to keep you and your family safe as you take the necessary steps to safely recover. Call Rainbow International at 855-724-6269 – available 24/7, 365 days a year – to discuss fire restoration services. Rainbow International’s fire damage restoration uses state-of-the art fire damage restoration technology and procedures to help get your home back to its pre-loss condition. Our professional technicians will treat your property with respect during the restoration process. Call 855-724-6269 or request a home restoration quote.